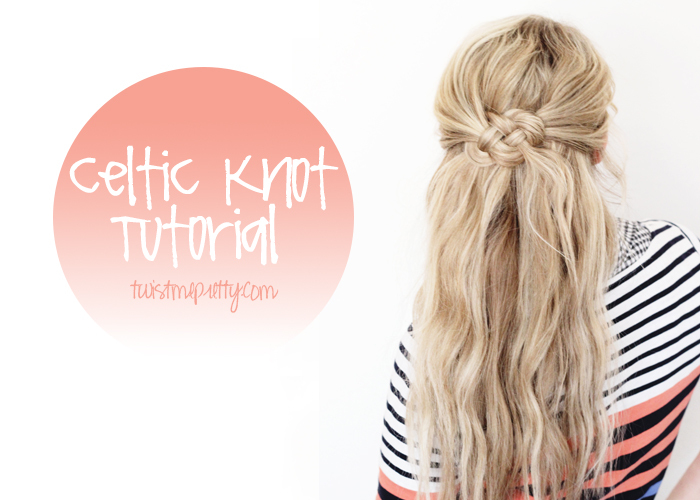 I just about died when I figured out this knot hairstyle, so naturally I wanted to make this celtic knot tutorial for you guys! Have you guys seen the celtic knot headbands? They are kind of adorable. 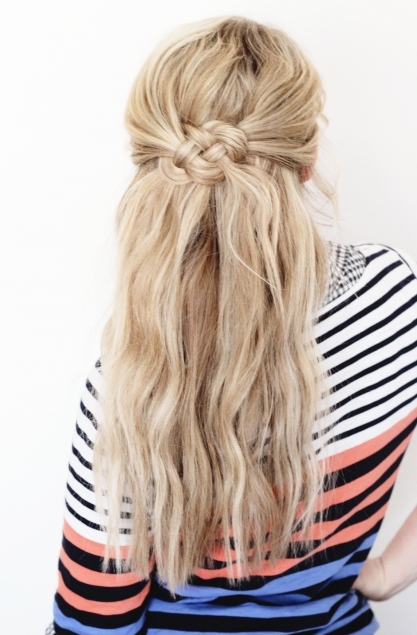 I was attempting to make one for Savy out of an old T-shirt and I thought… this would be so cute as a hairstyle! Lightbulb. On. Bright and burning. Once you learn the knot, it’s knot hard… hahaha get it… knot hard?! haaaha oh geese. If your knot familiar with the knot go ahead and practicing on some shoe strings. Just remember that when you’re doing this on yourself your hands will be flipped around so just familiarize yourself with the knot and knot the way you’re holding the strings. baahaaha, sorry I just couldn’t help myself! 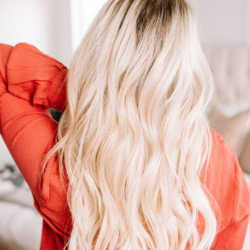 I used this technique to curl my hair and because I had just washed it I sprayed some dry shampoo all over to give my hair a dirtier texture. Help the style hold, ya know? >>>1 Take a chunk of hair from the left side. I’m just now realizing that these pictures might be backward. I’m left handed… sooo… if you’re not you might need to flip these images around in your head ha ha! Sorry ’bout that. >>>> 11 See the strand going through the loop? >> 14 Once you’ve pulled that strand all the way through it should resemble something similar to step 14. If it doesn’t, try again. It took me a good five or six times to get it right. Once you have that last step looking something similar to mine go ahead and fiddle around with the pieces of hair. You can loosen the knot to make it look fuller and you can also tighten it just a bit so that the pieces in the front aren’t too loose and baggy. Make sense? If that strand on the right is poking out go ahead and insert a bobby pin underneath it to tuck it back and secure the knot. 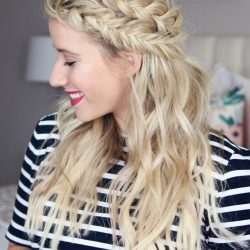 It might help you to try this hairstyle when your hair is wet. I didn’t use any product to smooth down fly aways. I kind of like the messier bohemian look. 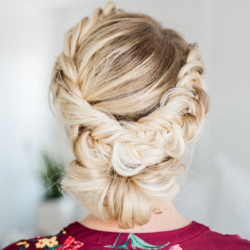 Is this seriously knot the cutest hairstyle ever? hahaha oh my gosh, I cannot help myself right now! The thing is it only takes a couple of minutes and people are like… whoa what? How in the world did you do that?! It’s the best. So go ahead and practice while you’re watching tv and I promise you’ll get it in no time! 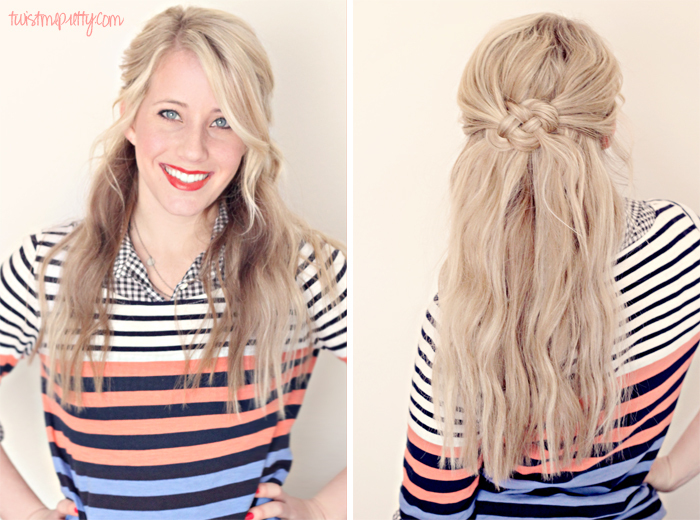 And as always, if you love this hairstyle help me share it by pinning it to one of your beauty boards!